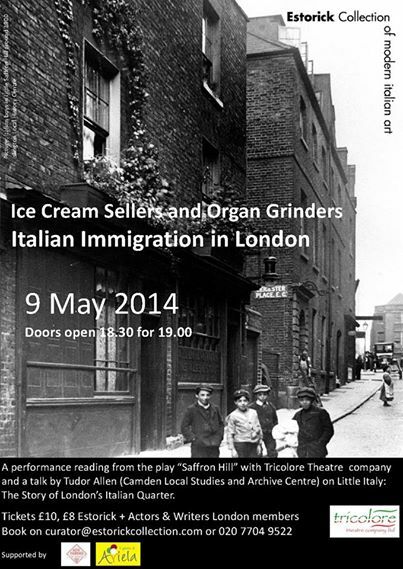 To book tickets email curator@estorickcollection.com or call 020 7704 9522. Following the outbreak of World War II in September 1939, the British Government became increasingly aware that there were thousands of “enemy aliens” living in the country. Some were refugees fleeing the Nazi onslaught, but some had lived in Britain for many years and were part of the community. Following the fall of France, and when Italy joined the war in June 1940, with fear of imminent invasion foremost in his mind, Winston Churchill implemented a policy of “collar the lot”. Regardless of length of residency, or political sympathies, the police were ordered to round up thousands of Germans and Italians and detain or deport them. This is the story of one fictitious Italian family, living in Saffron Hill and running a gelateria and cafe.